Intra group is the top rated manufacturers, suppliers and exporters of Hatcheck machine for Producing Cement Boards in emerging technology with excellent for supplying plant and machinery to different customers in India and across other countries. We use with high quality equipment for industry and automation since 1998. 1. The main source of production of raw materials is available widely with no region restriction. These products are made up of straw, sawdust and inorganic material . so the project have more effectiveness with less production cost. 2. The equipment’s will have high customization degree in simple production technology , production line and low labor intensity. There will no noise and wastes ( like water, waste residue and waste gas) during the production. 3. Low energy consumption during production. With manipulating chemical reaction, it can meet the high requirements about the production technology without any high pressure and temperature. Intra Group of companies is also a member of FAAPCI and actively participating in all programs and contributing latest technical expertise to entrepreneurs and updating ourselves. 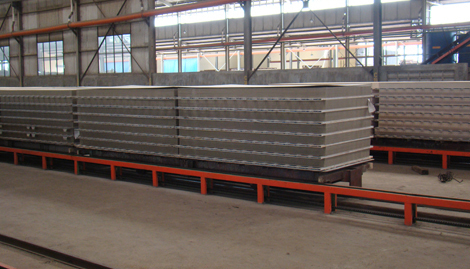 We provide well designed Hatcheck Machine for Producing Cement Boards to our valuable Customers.